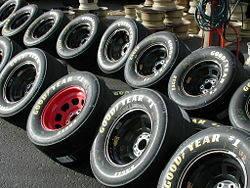 Rubber, an elastomer, is widely used for the manufacture of tires. An elastomer is a polymer with the property of elasticity. In other words, it is a polymer that deforms under stress and returns to its original shape when the stress is removed. The term is a contraction of the words "elastic polymer." There are many types of elastomers, most of which are rubbers. The term elastomer is therefore often used interchangeably with the term rubber. Other elastomers, which melt when heated, are classified as thermoplastic. Rubbers (both natural and synthetic) are widely used for the manufacture of tires, tubes, hoses, belts, matting, gloves, toy balloons, rubber bands, pencil erasers, and adhesives. Thermoplastic elastomers are used in manufacturing processes, such as by injection molding. Thermoplastic polyurethanes are used for various applications, including the production of foam seating, seals, gaskets, and carpet underlay. Elastomers are amorphous polymers with considerable segmental motion. Their general molecular form has been likened to a "spaghetti and meatball" structure, where the meatballs signify cross-links between the flexible polymer chains, which are like spaghetti strands. Each polymer chain is made up of many monomer subunits, and each monomer is usually made of carbon, hydrogen, and oxygen atoms, and occasionally silicon atoms. Most elastomers are thermosets—that is, they require curing (by heat, chemical reaction, or irradiation). In the curing process, the long polymer chains become cross-linked by covalent bonds, the material becomes stronger, and it cannot be remelted and remolded. Some elastomers are thermoplastic, melting to a liquid state when heated and turning brittle when cooled sufficiently. In thermoplastic elastomers, the polymer chains are cross-linked by weaker bonds, such as hydrogen bonds or dipole-dipole interactions. The elasticity is derived from the ability of the long chains to reconfigure themselves to distribute an applied stress. Covalent cross-linkages, in particular, ensure that the elastomer will return to its original configuration when the stress is removed. As a result of this extreme flexibility, elastomers can reversibly extend from 5 to 700 percent, depending on the specific material. Without the cross-linkages or with short, uneasily reconfigured chains, the applied stress would result in permanent deformation. The temperature of the polymer also affects its elasticity. Elastomers that have been cooled to a glassy or crystalline phase will have less mobile chains, and consequently less elasticity, than those manipulated at temperatures higher than the glass transition temperature of the polymer. At ambient temperatures, rubbers are thus relatively soft (Young's modulus of about 3 MPa) and deformable. (Note that unsaturated rubbers can also be cured by non-sulfur vulcanization if desired). Thermoplastic elastomers (TPE), for example Elastron, etc. Most elastomers are rubbers, including both natural and synthetic varieties. They are used mainly for the manufacture of tires and tubes. They are also used to produce goods such as hoses, belts, matting, gloves, toy balloons, rubber bands, pencil erasers, and adhesives. As a fiber, rubber (called "elastic") is valuable for the textile industry. Ethylene propylene rubber (EPR) is useful as insulation for high voltage cables. Thermoplastic elastomers are relatively easy to use in manufacturing processes, such as by injection molding. Polyurethanes are widely used in high-resiliency, flexible foam seating, seals, gaskets, carpet underlay, Spandex fibers, and electrical potting compounds. where is the number of chain segments per unit volume, is Boltzmann's Constant, is temperature, and is distortion in the 1 direction. These findings are accurate for values up to approximately 400 percent strain. At that point, alignment between stretched chains begins to result in crystallization from noncovalent bonding. Although Young's Modulus does not exist for elastomers because of the nonlinear nature of the stress-strain relationship, a "secant modulus" can be found at a particular strain. Budinski, Kenneth G., and Michael K. Budinski. 2002. Engineering Materials: Properties and Selection, 7th edition. ISBN 0130305332. Mark, James E., Burak Erman, and Frederick R. Eirich (eds.). 2005. Science and Technology of Rubber, 3rd edition. Amsterdam: Elsevier Academic Press. ISBN 978-0124647862. Meyers, Marc A., and Krishan Kumar Chawla. 2007. Mechanical Behavior of Materials. San Diego: M. Meyers. ISBN 978-1427614827. Treloar, L.R.G. 2005. The Physics of Rubber Elasticity, 3rd edition. Oxford: Clarendon Press. ISBN 978-0198570271. Ward, I.M., and J. Sweeney. 2004. An Introduction to the Mechanical Properties of Solid Polymers. Chichester, West Sussex, UK: Wiley. ISBN 978-0471496267. This page was last modified on 25 July 2008, at 16:03.